With the NL Central all bulking up their lineups, the Cardinals did just the same. They shipped Luke Weaver and a few others over to Arizona for Paul Goldschmidt. This gives them a big power bat from the right side. They have desperately needed a 30+ HR hitter in the middle of the order, even with Matt Carpenter’s power jumping up the last few seasons. This is going to be a pretty right-handed heavy lineup most nights, and they have other power bats like Marcell Ozuna and Paul DeJong. Yadier Molina also continues to pump out solid lines behind the dish. The Cardinals will also get Harrison Bader more at-bats this season, which he gives them some speed and another bat against left-handed pitching. This will be a tough team for left-handers, but dominate righties could have their way. 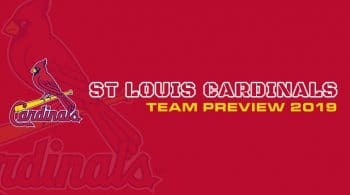 The Cardinals might not get enough recognition for their pitching staff, but they should. They don’t have the true top ten ace in their rotation, but a few above average arms in a good pitchers park has them on our map. They are an incredibly deep staff, and even losing Luke Weaver in the trade with Arizona for Paul Goldschmidt, they are not going to lose much when all is said and done. Weaver was heading for a league average right-hander, so parting ways wasn’t a bad idea at all, especially when you acquired an all-star first baseman to slug away in the middle of the order. Carlos Martinez has been the ace of this staff for a few seasons now, but battled injuries in 2018. Looking at a full year, Martinez has loads of talent to put up monster numbers. He has above average strikeout stuff, and his ERA stays fairly consistent. He has a plus fastball, which sets up his above average off-speed stuff. A healthy year will jump Martinez back up into the top 25 for starting arms. Miles Mikolas was someone who came over from playing overseas, and adjusted his game in a major way. He pitched 200 innings, and had a 2.83 ERA. He has pinpoint control, and can strike out some of the weaker teams. Mikolas adds to a very good rotation, especially as a number two. Jack Flaherty has a major fastball, and had 182 strikeouts in 151 innings last season. Flaherty is an up and coming pitcher on a league spectrum, but has blossomed into a top of the rotation arm in St. Louis. He is expected to take a major step forward in 2019, and if he can stay healthy, 200+ strikeouts are not out of the question for him. Michael Wacha is an average right-hander who makes for a pretty good fourth spot starter in the rotation. John Gant and Adam Wainwright will draw the rest of the starts, and both are struggling right-handers. Gant has an issue with left-handed hitters, and Wainwright is trying to cope with being an older arm in a game that has really changed. The Cardinals can try and bury this problem with the rest of the rotation being good, but also the offense can take some of the pressure off of this starting staff.